I'm yet to blog about weight loss but I've been getting fitter and healthier since the start of 2015 and I've already lost little over a stone (8.8kg)! Every year I say I'm going to lose weight and it never amounts to anything but after seeing my GP and realising how much I've been harming my body I can excited and fully focused this year. I wouldn't really say I'm on a diet, I'm more eating better and eating high protein, low carbs and going to the gym at least once a week. 1. FitBit & FitBit App - I've not taken my fitbit off my wrist since the day I bought it (other than charging it)! I have a FitBit Flex. The FitBit Flex tracks your daily steps, how far you've walked, how many calories you've burnt, how many minutes you've been active, your food intake, your sleep pattern and how much water you've drank. As you can see from my screenshot I did 43 active minutes, burned 3108 calories and walked 4.56 miles in 10,774 steps in one day. I was pretty proud of myself because I've been in a lot of pain after being in hospital and this was my first day leaving the house after coming home. The FitBit app also tells you when you're not far off from your goal to motivate you to meet it. 2. My Fitness Pal App - This app really is my fitness pal, I'd be lost without it and for an added bonus it connects with my FitBit app. My Fitness Pal allow you to scan the packaging of any item you're about to eat and tells you how many calories, fat, carbs, protein and so on is in it. I put how much I weigh, how much I want to weigh, how active I am each day and MFP says I should have no more than 1200 calories a day to lose 1kg a week. What I love most about MFP is the fact it prompts me to eat breakfast, lunch and dinner the same time everyday so my body gets use to the lower calorie intake. 3. 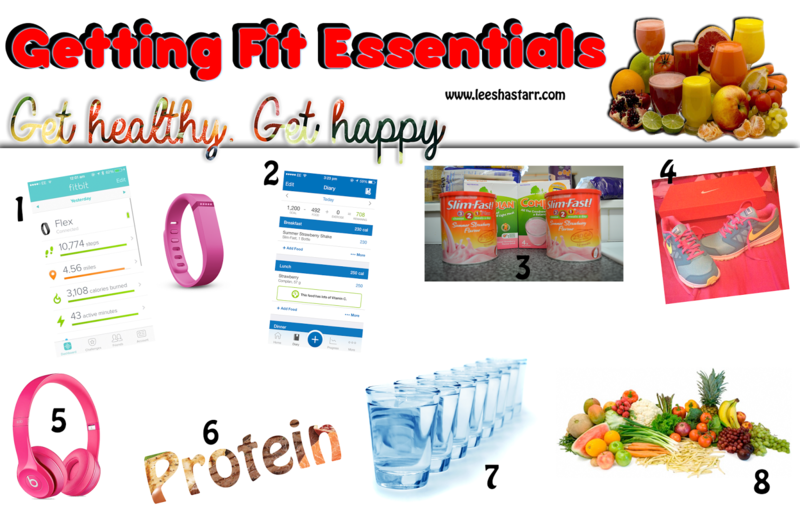 Slimfast & other protein shakes - I've never been a fan of slimming shakes because to me they are a fad diet but I've really taken to the slim fast diet. I'm not fully following the rules because I just have one or two shakes a day plus a 500-600 calorie dinner. I try hard not to snack but if I do I'll have a low calorie jelly or fat free yoghurt. It means I have on average 1000 calories which seems to be working well for me. 4. Gym trainers - I found these last month in Sports Direct for £25 and I fell in love instantly, they make you feel like you're walking on clouds. They are super cute too which is always a bonus. Whenever I know I'll be walking more than a mile I stick these on as they are so much more comfortable than any other trainers I have. 5. Headphones - When I'm listening to music I don't even realise I'm working out. I have a work out play list which gives me loads of motivation. These are perfect when I'm at the gym, it also allows me to watch the TV on the treadmill. You'll often find me laughing at The Big Bang Theory while I walk on the treadmill. 6. Healthy protein - A high protein, low carb 'diet' is always best. Protein helps build muscle, helps with nail and hair growth, helps your body repair for me often makes me feel less hungry. Protein comes in many forms, from powder shakes, meat, eggs, fish and beans. I often get my protein from shakes, meat, fish. I also picked up some protein snacks online from Go Nutrition and My Protein. My favourite were the Protein Bites from My Protein. They have 15g of protein per pack and little over 100 calories per bag, a lot less than a normal bag of crisps. I'll be posting about my protein bites in the near future so keep an eye out. 7. Water - I find if I am drinking loads of water I feel less hungry. I put my water in a sports bottle which hold 700mls of water, this way I can track how much I am drinking and how long it takes me to drink it. Only side effect is needing the loo more often. Water also flushes out toxins, clears your skin and can help with headaches. But most of all water is calorie free! I try to wake up early and drink loads of water before I even start the day. This sets me up for the day ahead. I've also stopped drinking while I eat as this can allow foods to get into your stomach quicker without gaining the nutrients. 8. Fruit & vegetables - Fruit & veg is low in calories, has plenty of vitamins and fibre and tastes awesome! Fruit can also Lower your cholesterol & blood pressure. I love apples, strawberries, tomato, lettuce and brussels sprouts. I may not have 5 a day but I always make sure I have at least two, I'd say on average I have at least 3. Have you got any tips for weight loss? I am hopeless at drinking water, unless I mix it with Vimto! I need to lose a stone too. Have bookmarked your page and I'm going to keep coming back until I've made some moderate progress with my weight loss resolutions. Wish me luck!! I've been wanting a FitBit for ages! A pink one too. Hopefully I can get one soon because I'd love to use for when I go on walks or runs! I absolutely love the My Fitness Pal app, I've been using it for just over a month & I can't imagine managing my weight without it. I'd love to get a Fit-Bit, I might have to treat myself! Sadly slim fast doesnt work for me so I just stuck to eating clean and cutting out bad food :) great choice of apps though .. we use the same ones, yay,..
Wow, losing can be so much fun. I'm trying to lose my paunch for over a year without any success. Wish me luck. thanks for sharing the tips hun!let's get fit! You put together a nice list. Headphones are a must for me when working out. The only thing I can find myself sticking to is drinking lots of water. I really need to start focusing on eating healthier. Thanks for all the great tips and apps!